May 24, 2016 – Dark matter is a mysterious substance composing most of the material universe, now widely thought to be some form of massive exotic particle. An intriguing alternative view is that dark matter is made of black holes formed during the first second of our universe’s existence, known as primordial black holes. Now a scientist at NASA’s Goddard Space Flight Center in Greenbelt, Maryland, suggests that this interpretation aligns with our knowledge of cosmic infrared and X-ray background glows and may explain the unexpectedly high masses of merging black holes detected last year. In 2005, Kashlinsky led a team of astronomers using NASA’s Spitzer Space Telescope to explore the background glow of infrared light in one part of the sky. The researchers reported excessive patchiness in the glow and concluded it was likely caused by the aggregate light of the first sources to illuminate the universe more than 13 billion years ago. Follow-up studies confirmed that this cosmic infrared background (CIB) showed similar unexpected structure in other parts of the sky. 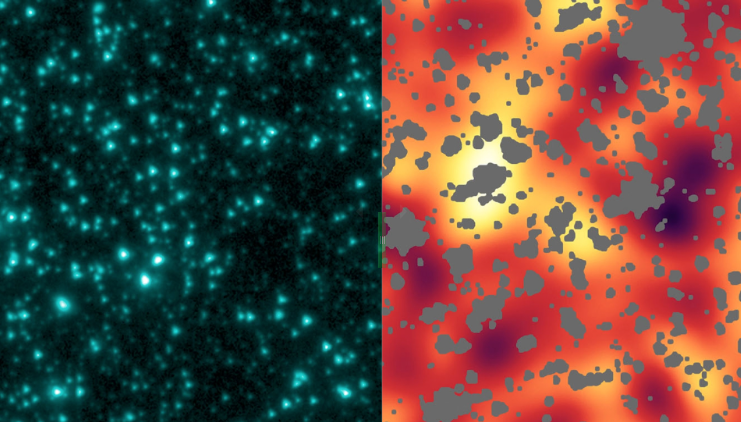 In 2013, another study compared how the cosmic X-ray background (CXB) detected by NASA’s Chandra X-ray Observatory compared to the CIB in the same area of the sky. The first stars emitted mainly optical and ultraviolet light, which today is stretched into the infrared by the expansion of space, so they should not contribute significantly to the CXB. Yet the irregular glow of low-energy X-rays in the CXB matched the patchiness of the CIB quite well. The only object we know of that can be sufficiently luminous across this wide an energy range is a black hole. The research team concluded that primordial black holes must have been abundant among the earliest stars, making up at least about one out of every five of the sources contributing to the CIB. Physicists have outlined several ways in which the hot, rapidly expanding universe could produce primordial black holes in the first thousandths of a second after the Big Bang. The older the universe is when these mechanisms take hold, the larger the black holes can be. And because the window for creating them lasts only a tiny fraction of the first second, scientists expect primordial black holes would exhibit a narrow range of masses. 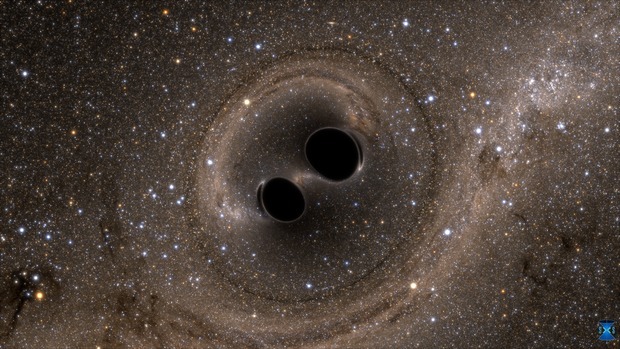 On September 14, gravitational waves produced by a pair of merging black holes 1.3 billion light-years away were captured by the Laser Interferometer Gravitational-Wave Observatory (LIGO) facilities in Hanford, Washington, and Livingston, Louisiana. This event marked the first-ever detection of gravitational waves as well as the first direct detection of black holes. The signal provided LIGO scientists with information about the masses of the individual black holes, which were 29 and 36 times the sun’s mass, plus or minus about four solar masses. These values were both unexpectedly large and surprisingly similar. In his new paper, published May 24 in The Astrophysical Journal Letters, Kashlinsky analyzes what might have happened if dark matter consisted of a population of black holes similar to those detected by LIGO. The black holes distort the distribution of mass in the early universe, adding a small fluctuation that has consequences hundreds of millions of years later, when the first stars begin to form. For much of the universe’s first 500 million years, normal matter remained too hot to coalesce into the first stars. Dark matter was unaffected by the high temperature because, whatever its nature, it primarily interacts through gravity. Aggregating by mutual attraction, dark matter first collapsed into clumps called minihaloes, which provided a gravitational seed enabling normal matter to accumulate. Hot gas collapsed toward the minihaloes, resulting in pockets of gas dense enough to further collapse on their own into the first stars. Kashlinsky shows that if black holes play the part of dark matter, this process occurs more rapidly and easily produces the lumpiness of the CIB detected in Spitzer data even if only a small fraction of minihaloes manage to produce stars. Occasionally, some primordial black holes will pass close enough to be gravitationally captured into binary systems. The black holes in each of these binaries will, over eons, emit gravitational radiation, lose orbital energy and spiral inward, ultimately merging into a larger black hole like the event LIGO observed. “Future LIGO observing runs will tell us much more about the universe’s population of black holes, and it won’t be long before we’ll know if the scenario I outline is either supported or ruled out,” Kashlinsky said. Kashlinsky leads a science team centered at Goddard that is participating in the European Space Agency’s Euclid mission, which is currently scheduled to launch in 2020. The project, named LIBRAE, will enable the observatory to probe source populations in the CIB with high precision and determine what portion was produced by black holes.